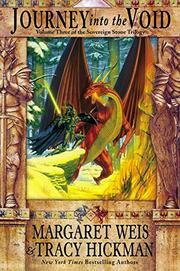 Rousing, action-heavy, well-plotted conclusion to the prolific fantasy duo’s sprawling, derivative sword-and-sorcery trilogy. For all its nods at Tolkien (wizards, humans, dwarfs, elves, orcs—spelled here with a k—and other squabbling fantasy beings must join forces to deal with powerful magic desired by an villain) and Star Wars (reluctant but resourceful heroes, sardonic derring-do, even an evil character whose hand is sliced off) and other pop-culture genre triumphs, this trilogy rises above the rest by giving its characters, human and otherwise, a spirited dignity as they bring the four fragments of the Sovereign Stone to the pseudo–Middle Earth city of New Vinnegael, where the power-mad Lord Dagnarus, a master of deadly “void” magic, and his army of beastly but occasionally charming Taan, want to put the fragments together so he can attain godlike powers. As usual, the authors open with the death of a major character and also a resurrection: Baron Shadamehr, who, in the previous installment, was stabbed with a deadly void knife, is brought back from the edge of death by the love—and sorcery—of the beautiful Alise. The Vrykyls, intelligent zombies who assume the shape of beings they kill, are the most interesting characters here, and the wily Shakur, who’s assumed the shape of Vinnegael’s regent is a conniving hoot. The others, including the awful Dagnarus and his father Tamaros, who, like any kindly fantasy character, can’t stay dead, are genre knock-offs who struggle mightily but can’t stop Dagnarus from reassembling the Stone. Good doesn’t so much triumph as does megalomania fail. Better-than-average fantasy retread that offers few surprises but tells the familiar quest story with a dash of wit and verve.